The last battle of the Revolutionary War was fought in 1951 in Winchester, Virginia. Daniel Morgan, the “Old Wagoner” or ‘Old Morgan” as he was known to his soldiers, was front and center of the maelstrom once again just as he was on many a battle field from Quebec to South Carolina during the War for Independence. Residents of Cowpens, South Carolina, a small town near Spartanburg named for Morgan’s dramatic and strategically critical victory of 1781, arrived in Winchester, Virginia to claim the earthly remains of their revered hero. Morgan’s grave was overgrown and in decrepit condition. In Winchester, only one out of forty people queried by the Carolinians knew who Morgan was. Armed with shovels, a mortician, and a letter of authorization from Morgan’s great-great granddaughter, the Carolinians showed up at Mount Hebron Cemetery to dig up the general, take him “home” and reinter him at the site of his greatest victory. There he could rest among a populace that revered his name and cherished his significant contributions toward American independence. However, word of the Carolinians’ attempted exhumation of Morgan quickly spread through town and a contingent of devoted local admirers quickly headed to Mt. Hebron to stop the Carolinians initiative. In the end, a court ruled that the “Old Wagoner” would remain interred at Mt. Hebron in Winchester. Not only did he stay, but this episode kindled a reverence for the General’s legacy and place in history among Winchester’s populace. Seventeen year-old Daniel Morgan moved into the Shenandoah Valley in 1753, with nothing but sheer determination to carve out a life for himself in the rugged frontier of western Virginia. His early years are shrouded in mystery that Morgan himself kept secret from even his closest associates throughout his life. He was born of Welsh parentage in 1836 in Bucks County Pennsylvania or Hunterdon County, New Jersey, the fifth of seven children. It was a hard life of work on the family farmstead with no opportunity for even a rudimentary education. His time was spent chopping wood, hoeing fields and other taxing physical labor. His mother died when he was young, and his father remarried. A dispute with his father prompted the fiery Morgan to head west on the Great Wagon Road to Carlisle, Pennsylvania where he worked briefly during the winter of 1752-53, before continuing south to the Shenandoah. Although Morgan lacked an education, the work on the family farm had hardened his six-foot, two-hundred pound frame into a powerful and muscular young man who was well suited for the physicality of life on the frontier. The blue-eyed youth initially obtained employment as a farm laborer in eastern Frederick County in what is now Clarke County. He worked hard and soon earned an offer of better employment. In spite of his youth, Morgan eared employment as the overseer of a saw mill where he learned to manage older and more experienced men, developing his leadership ability. Morgan’s energy and work ethic impressed Robert Burwell who offered Morgan a position as a teamster hauling valley produce across the Blue Ridge to Fredericksburg and other towns in the Virginia Piedmont and carrying badly needed supplies back to the frontier that was the Shenandoah Valley of the 1750’s. Morgan enjoyed the freedom of the open road and in less than two years had earned enough money to buy his own team and Conestoga wagon. During this time, Morgan had become close friends with fellow teamster John “Captain Jack” Ashby, grandfather of the Virginia Civil War cavalryman. Ashby was noted for his “horsemanship, marksmanship and daring exploits.” Ashby taught Morgan to shoot, hunt, ride and live in the wilderness along the Blue Ridge. The two men were kindred spirits and became good friends. In 1755, the French and Indian War came to the Shenandoah Valley when British Maj. Gen. Edward Braddock’s column passed through the Winchester area on its way to wrest Fort Duquesne from the French at the “Forks of the Ohio,” now the site of Pittsburgh. Morgan signed on the haul supplies to Fort Cumberland in western Maryland and soon found himself as a teamster with the army, rolling into western Pennsylvania. When the French and Indians routed Braddock at the battle of the Monongahela in July, the teamsters emptied their wagons of supplies and carried wounded soldiers back to Fort Cumberland. At some point in this campaign, Morgan’s actions or words angered a British officer who violently chastised the young teamster and struck him with the flat of his sword. Morgan’s temper exploded, and the young wagoner knocked the officer out with one strong punch. A court martial sentenced Morgan to 500 lashes, a punishment that often killed its recipients. The stout Morgan endured the suffering and noted that the drummer miscounted and he had only received 499 lashes. He would proudly wear the scars suffered at the hands of the British for the rest of his life. With Braddock’s devastating defeat, the French and Indians went on the offensive raiding into western Virginia. Morgan enlisted in a Ranger Company commanded by his friend, “Captain Jack” Ashby. Morgan spent much of his time patrolling the wilds of the Allegheny Mountain posts of Hampshire County and building stockades to defend against the marauding French and Indians. On one occasion while carrying messages to one of the forts along with two other men, Indians waylaid his party at Hanging Rock on the Cacapon River, killing his comrades. They shot Morgan in the neck, but he raced away on his horse, narrowly escaping the tomahawk of a pursuing Indian. Morgan lost consciousness from blood loss, but luckily the horse had the path to fort ingrained in her memory and carried him back to safety. Morgan remained in the Ranger Company until Col. George Washington disbanded it in October. Morgan began a period of multiple pursuits. He sojourned himself in the wilds for several months trying his hand as a hunter. He likely spent time as a militiaman in Frederick County. By 1758, however, he almost instinctively returned to the open road, hauling wheat, tobacco and hemp across the Blue Ridge to eastern Virginia commercial centers such as Alexandria, Dumfries or Fredericksburg. In driving the wagons, Morgan had found his calling. The harsh life of the teamster suited his rough and tumble personality. He quickly gained a reputation as on the leading pugilists of the Shenandoah Valley. 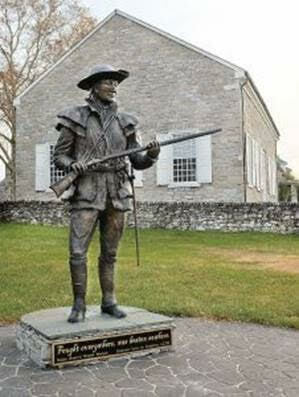 He could often be found at Berry’s Tavern in what is now Berryville but at the time was known as Battletown because of the constant brawling that occurred at the tavern. These were brutal affairs that included wrestling, punching, choking and gouging of eyes, but Morgan reigned as the champion. Although not always victorious, the stout teamster made sure there was a rematch which he usually won. In spite of his reputation for drinking and fighting, Morgan prospered as a successful teamster, even if his brawling occasionally landed him on the docket of the Frederick County Circuit Court. In 1762, he found love with Abigail Curry who became his common-law wife, introduced him to the Presbyterian religion and bore him two girls. At her request, he cut back on drinking and brawling. He also rented a tract of land began farming marketable crops. Morgan had finally found the good life he sought in the Valley of Virginia. 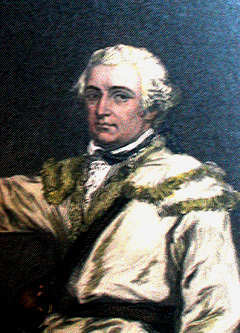 With talk of independence in the air in 1774, Morgan participated in Lord Dunmore’s War. He was part of a column that operated in the Wheeling, Virginia area. They attacked Indians along the Muskingum River in the Ohio Country and drove them off, but he did not participate in that war’s decisive action at Point Pleasant. As the war drew to a close, word of the troubles in Boston circulated among the men, and Morgan was among those who committed to solidarity with the Massachusetts patriots. Part Two will cover Morgan in the opening years of the American Revolution, so check back next week. A life-long student of military history, Scott C. Patchan is a graduate of James Madison University in the Shenandoah Valley. He is the author of many articles and books, includingThe Forgotten Fury: The Battle of Piedmont (1996),Shenandoah Summer: The 1864 Valley Campaign (2007), andSecond Manassas: Longstreet’s Attack and the Struggle for Chinn Ridge (2011). Patchan serves as a Director on the board of the Kernstown Battlefield Association in Winchester, Virginia, and is a member of the Shenandoah Valley Battlefield Foundation’s Resource Protection Committee. This entry was posted in Battlefields & Historic Places, Battles, British Leadership, Common Soldier, Monuments, Personalities, Uncategorized and tagged Ashby, Boston, Daniel Morgan, Edward Braddock, Frederick County, French and Indian War, George Washington, Lord Dunmore War, Mount Hebron Cemetery, Point Pleasant, Scott Patchan, Shenandoah Valley, Virginia, Winchester. Bookmark the permalink. Nice article. I’ve read about Morgan before and am interested since he was an early resident of Winchester. A few decades later – during the Civil War – were Valley residents aware of Morgan; how did they feel about his legacy then? Also, just wondering if “Captain Jack” Ashby was an ancestor of Turner Ashby of the Civil War era? I think it’s great that you are doing an article on an under appreciated officer of the Rev war and one of the best field officers of rhe war. He is my favorite and pretty familiar with him. I’m from NJ so I believe that he was born here. There is a monument and other information about him in new hampton, nj. I’m looking forward to part 2. Keep up the good work.